This photo of the moon's south pole, taken by NASA's Lunar Reconnaissance Orbiter, shows some of the permanently shadowed regions. Some of the most intriguing areas on the moon are the hardest to see. These spots, called permanently shadowed regions, are always dark and never reflect sunlight, so telescopes and satellites have no way to image them in regular light. Now, researchers have used a more devious method to view these areas and found that they may be relatively abundant in water ice. 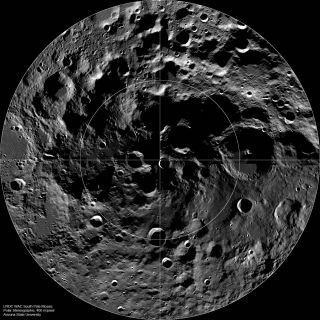 The permanently shadowed regions are located on the moon's poles and are usually deep in craters where sunlight can't reach. To view these areas, scientists used light that's reflected off hydrogen atoms floating throughout the universe that spreads in all directions, even hitting areas in shade. This light, called lyman alpha emission, shines in a particular, narrow wavelength band. "Instead of sunlight reflected straight off the craters themselves, we go an indirect route," said study co-author Kurt Retherford, a senior research scientist at the Southwest Research Institute in San Antonio, Tex. "Our light shines off hydrogen atoms spread throughout the solar system." These images (insets) produced by the Lyman Alpha Mapping Project (LAMP) aboard NASA's Lunar Reconnaissance Orbiter reveal features at the Moon's northern and southern poles in the regions that lie in perpetual darkness. Scientists think these areas may hide fluffy dirt and water ice. "Our best explanation for this difference in reflectance at the poles is that the surface is more porous and fluffier," Retherford told SPACE.com. "It's a powdery, flour type of material." Scientists think that water might be responsible for the fluffy dirt at the moon's poles. Small particles of water frost moving in and out of grains of dirt may result in more holes between the grains, giving it a porous texture. Previous studies have found that the dirt at lower latitudes on the moon, which are exposed to sunlight, might include up to 0.5 percent water ice. The new study indicates that water could account for up to 2 percent of the dirt in the permanently shaded regions. "You would expect there to be more in the permanently shadowed regions than what we see outside," Retherford said. The finding fits in with scientists' growing realization that the moon, once thought to be bone dry, may contain small but significant stores of water. "One day, when an astronaut goes to these regions, we need a better sense of what they would see," Retherford said. "Most previous measurements of water pertain to water that's very beneath the surface. But we're really dealing with what the surface of these things looks like. The water that's there is going to be some of the more accessible stuff to astronauts in the future."